Outline planning permission for the erection of up to 200 dwellings, a Health Centre, a Doctors Surgery, retail outlets and office/employment space with all matters reserved for subsequent approval. Land Off Bleadon Road Bleadon North Somerset. Comments deadline is 03 May 2018. Here is the link to the application 17/P/5545/OUT on North Somerset Council Planning website. If you do make comments on this BOB blog (below), please also make sure that they are made to, and appear on, the North Somerset website link as above. As otherwise they will be ignored by NSC. Please also remind your neighbours too. The Bleadon Acting Together Group is also happy to help and hear from you if you would like some further information.UPDATE (15 may 2018): The group submit an objection to NSC re: 200 houses application via a proffesional consultant. NB: When did NSC officers, and or District Councillors, notify BPC about this application? This application was published on the NSC Planning Weekly & Monthly Lists, validated week beginning 19 Mar 18, accessible to Parish Councils? BPC met on 12 & 28 Mar 18, and APM on 10 Apr 18. There was no BPC Full Council meeting scheduled in April and there is none scheduled until 14 May 18 (as of 10 Apr 18). Bleadon is an Infill Village (NSC CS33) with development defined in relation to a Settlement Boundary. This large scale application is outside the settlement boundary. Residents rejected a proposal in 2017 for a school and 250 houses and submitted a petition signed by residents to the landowners. Additonal information on this potential development site can be found on BOB. Just because health facilities/doctor's surgery is offered doesn't mean that it will be built and/or staffed. NSC do not manage this service (NHS England/Central Government do). Worst case scenario, 200 houses are built but no health/doctors services. If you would like to effectively object to this application, information on how to do so can be found on BOB. Also a resident has asked BOB to post these objection notes. What policies and plans can be used to protect Bleadon? In the adopted 2009-29 Parish Plan, as seen in the 103 Improvements, residents of Bleadon made it quite clear that they wanted to retain the character of Bleadon "Ensure that new development remain the scale and style of our Somerset village . 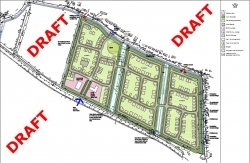 Ensure that all new development remains within the Village Settlement Boundary" Also, "Through the Planning process vigorously question all development outside the Village Settlement . Protect and enhance bio-diversity and the rural landscape through the District Council's Planning and Environmental policies"
In Dec 2012 BPC originally investigated a Neighbourhood Plan but ultimately decided against one (Min 249.5.5). In Aug 2017 BPC "Estimated two years to complete the full plan, however highlighted that if there is an emerging plan it is something that will be considered in local planning decisions." (Min 298.25). In Feb 2018 stated "The initial urgency [for a NDP] was due to grant funding ending in March 2018" ; acknowledged that the "opportunity to limit current over-development has [already] been lost" and then "Agreed that the Neighbourhood Plan Process be suspended." (Min 305.10). In Apr 18, at the Annual Parish Meeting, BPC were asked to update 'all' residents on their NDP Project to date. Hopefully BPC will release the project information, and state whether there is an 'emerging plan' from their project work since July 2017, that can help Bleadon with this application, ASAP. NSC New Local Plan. "Work has now commenced on the new Local Plan which will provide detailed policies and additional housing, employment and other land allocations up to 2036. It will review and roll-forward policies and allocations in existing development plan documents and plan for the housing, jobs and infrastructure set out in the Joint Spatial Plan (JSP)" Hopefully BPC can give residents an update on these projects and how they can help Bleadon with this application ASAP. In Jan 2018 District Councillor Porter stated "... With regard to NSC’s Sites and Policies Plan, he was hopeful that the Inspector would sign it off as acceptable in the not too distant future and this would put the planning authority in a much stronger position." (Min 304.4) Hopefully BPC can give residents an update on this and how it can help Bleadon with this application ASAP. In Aug 2017 BPC "To review and discuss the correspondence regarding North Somerset Local Plan 2018-2036 - Bleadon Settlement Profile." (Min 298.7) Hopefully BPC can give residents an update on this and how it can help Bleadon with this application ASAP. Hi may 2 2018 around 6pm another accident between Catherine's Inn and bridge garage medical helicopter needed my point is and they want to build 200 houses on those fields! !